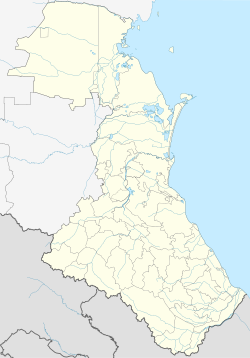 Yuzhno-Sukhokumsk (Roushie: Ю́жно-Сухоку́мск) is a toun in the Republic o Dagestan, Roushie, locatit on the Sukhaya Kuma River, 295 kilometers (183 mi) northwast o Makhachkala. Population: 10,035 (2010 Census); 9,777 (2002 Census); 12,246 (1989 Census). It wis grantit urban-teep dounset status in 1963 an toun status in 1988. Athin the framewirk o admeenistrative diveesions, it is incorporatit as the Toun o Yuzhno-Sukhokumsk—an admeenistrative unit wi the status equal tae that o the destricts. As a municipal diveesion, the Toun o Yuzhno-Sukhokumsk is incorporatit as Yuzhno-Sukhokumsk Urban Okrug. This page wis last eeditit on 8 Mairch 2018, at 06:10.